She ran 26.2 miles for our babies. She carried them in her heart and on her jersey. Do you see my Brooke? She’s right there to the left of the puzzle piece. She ran for the future. She ran because she had to. She ran because she is stronger than she’s ever been, even when she feels the weakest. She ran because she has been through the fire. And she knows there’s nothing she can’t do. She started an hour after Luau. 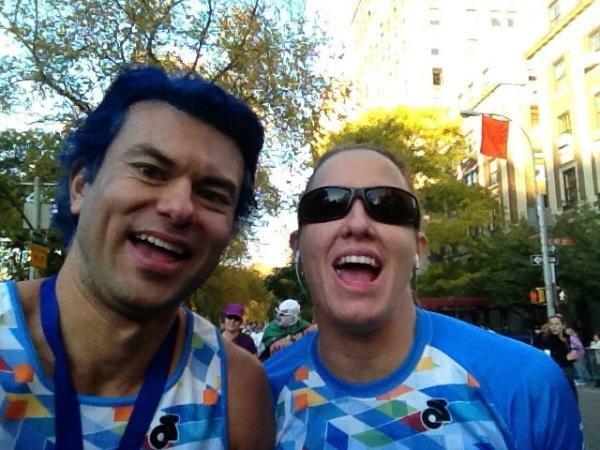 He ran his race, blue hair and all, then turned around at the finish and ran back to find her. He’d made a promise. She wouldn’t finish alone. He waited for her at mile 23. 17 of us waited with bated breath, glued to our screens. Did he find her? Was she ok? They ran the last 3.2 miles together. That’s what we do in this community. We go back for each other. We encourage each other. We love each other. We remind each other why, when it feels like we’re getting nowhere, we still have to put one foot in front of the other. @diaryofamom @luau I kept going cause I knew he was waiting for me. Mile 18 almost broke me.
.@MomtoBoyWonder Oh honey, if #autism couldn’t break you, mile 18 sure as hell wasn’t gonna do it. So glad @luau cld be there though. Luv u! Congratulations AND THANKS to everyone who performed this super-human feat yesterday in the name of a better life for our kids. We are so grateful. 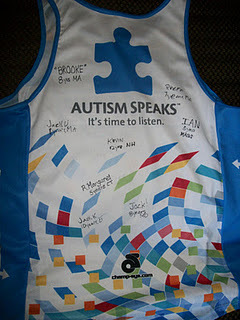 If you ran to raise money and awareness for autism or know someone who did, please give a shout out in the comments! And Luau, you’re crazy, babe, but you’re my crazy and I love you. Thank you for being there for my friend. It’s everything. I may even forgive you for calling at bedtime and telling Katie that Mama must have forgotten it was Daylight Savings Time. Thank you so much, Jersey! This is one wonderful community for all of our kids. So proud of my friend! She inspires me everyday. Yesterday she was my hero. What she did for all our friends was…incredible. Watching her progress online was the most exciting thing I’ve done in a while…as her name moved across the map I knew my kids names were moving with her too. 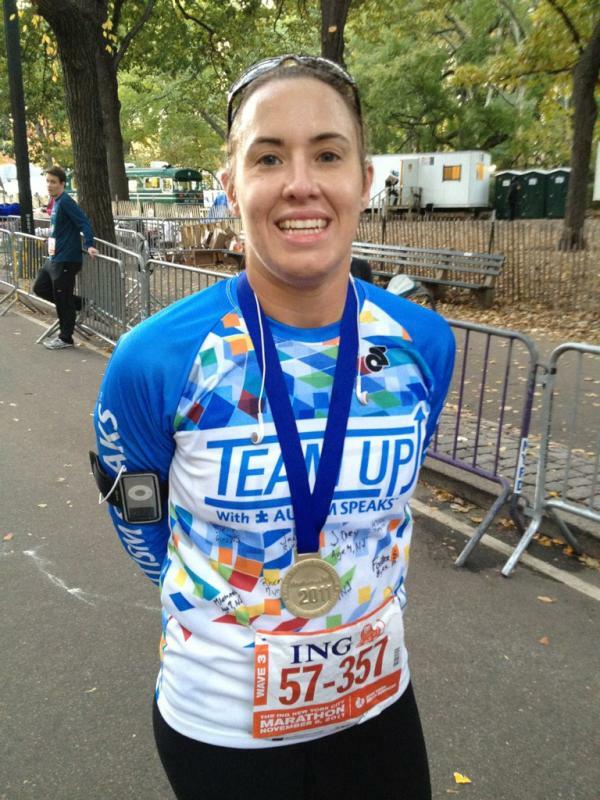 We joined with Twitter friends who followed her just because she was running for kids too. when she connected with Luau, I cried. I cried when she crossed the finish line. They are both superheroes in my book. Congratulations Jen!!!!!!!!!!!!! Watched the last hour or so with anticipation and pride for you!! She’s a badass. I am so proud of her too. And Luau. Way to go!!!! We watched and cheered from the halfway mark to the finish line. Afterwards my family went to the park where I ran 1/2 a mile and probably another 1/2 chasing footballs as my son practiced field goals. That about did me in and I came home with a whole new appreciation for marathoners. Way to go, Momtoboywonder and Luau…and thank-you! Badass sounds just about right. Badass with a sweet heart that does us all in. As always, thanks, Luau. You’re pretty fecking awesome too! Thank you to Mom to Boy Wonder and to Luau, on behalf of an Autism momma in the Midwest. What you did for these kids, what you do for them daily, is nothing short of amazing. Thanks! yay for her! that’s an amazing, amazing accomplishment. such a big heart she and luau have, it’s an impressive, lovely thing they did. I love my Jersey Girl!!! And Luau- keeping that promise and running through that park again so that Jersey didn’t have to run alone is nothing short of heroic. It was an amazing sight. So glad I got to see it for myself. XOXO I adore you both!! Jen and Luau, you are both amazing! I was at home alone. One person (Niksmom), then another (Cee Cee) started cheering, telling us what was going on. Luau and Jersey just by running, just by their commitment to put one foot in front of another, brought us all together – truckloads of us – cheering together, sharing love, and feeling the warmth of a huge community. Please give our thanks to Luau and Jersey for bringing us all together – for them, for you, for the kids. It was wonderful. SO awesome! I’m so proud of both of them! Wish I could’ve been there… Maybe next year! go jersey!!! so proud of you. my friend Dawn Cobak also ran for all of us. she started a wonderful non-profit, For Jake’s Sake that provides a way for people with autism to access effective therapies that they could otherwise not afford. thank you jersey, luau, and dawn for the way you inspire us. we love you! Thank you everyone for all your well wishes and cheers. I am humbled and grateful for all the support and well wishes I received yesterday. And so deeply grateful to Luau for running me in when I was ready to break. I have said before while I struggle with the fact that I have a child who is profoundly autistic I am very grateful for the wonderful amazing people autism has brought into my life. Jersey aka MomtoBoyWonder cause he is such a wonder.